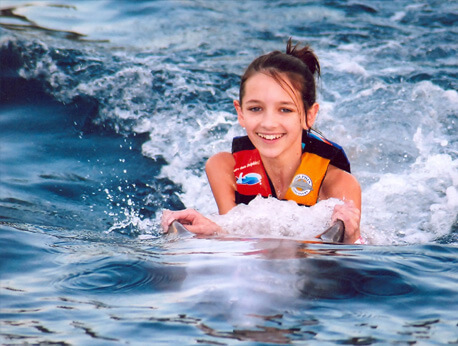 Dolphin Discovery at Gulf World in Panama City Beach, FL offers a Dolphin Swim Adventure that will make any beach vacation complete. Come learn about and interact with our marine mammal friends in a safe environment. Let us be your guide to the fascinating underwater world of dolphins. Dolphins are one of the most intelligent creatures on the planet. Their underwater world is foreign and fascinating to us land dwellers. Let Dolphin Discovery help you learn about and interact with these amazing creatures at Gulf World in Panama City Beach, FL. Our dolphin swim adventure will provide an experience you will be sure to remember. The Dolphin Swim Adventure includes a briefing on how to interact with our dolphin friends followed by 35 minutes in the water. One of our trainers will help you get a belly ride, a hug, a kiss, and a handshake from a dolphin. Our dolphins will also show you some of their tricks and fun games they love to play. Come early to make sure everyone gets the maximum amount of time with the dolphins. Stick around after for our sea lion show, to learn more about your new found dolphin friends, and to check out everything else our park has to offer. Safety for all our guest, human and dolphin alike, is always a number one concern. Please contact us beforehand if you are ill or have a disability, and we can provide you with more information about our services and policies. Remember to use biodegradable sunscreen to help protect your skin and our dolphin friends. All participants must wear a life vest and be at least 3'11" to enter the water. Kids must have a paying adult with them in the water. For the safety of you and your family, pregnant women cannot participate in our interactive programs. Wear your swimsuit, bring a towel, and come ready to learn and have some fun. We have programs daily so book now and let Dolphin Discovery complete your Panama City Beach vacation with a memory that will last for years to come.